Standard Quantex pumps are configured to regulate the maximum output pressure (typically around 15psi). If an occlusion occurs downstream, the pump will never generate more than this 15psi limit. For pressures in excess of this a high pressure pump configuration is required. High pressure pumping is achieved using a pressure feedback loop (PFL). The PFL feeds the high pressure generated downstream (due to a nozzle, valve or restriction) back into the pump seal, thus sealing the pump tighter and generating more pressure at the outlet. This ingenious high pressure option can be incorporated into any pump for high pressure applications. Catalogue and bespoke pumps can be supplied with or without this option. The high pressure option provides high efficiency and accuracy when pumping against valves with high opening pressure (e.g. aseptic valves) and narrow tubing with viscous liquids. The high pressure single-use pump can be used as an alternative to gas propellants used in aerosols. The pump when attached to a spray nozzle can produce pressures of up to 90psi. See the video showcasing the LHP-13 pump attached to a spray nozzle and liquid pouch. The graph below compares the Quantex pump output with a compressed nitrogen propellant. 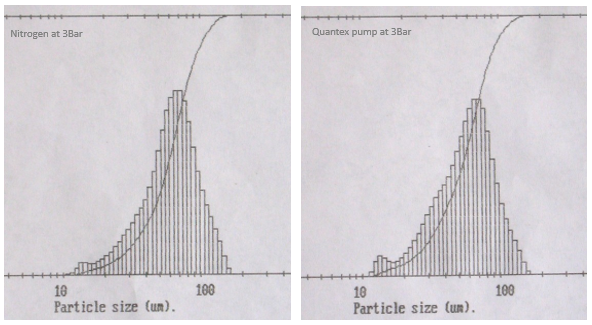 The Quantex LHP-13 pump produces a similar particulate size distribution chart as water sprayed using compressed nitrogen though a MBU nozzle. In other categories the Quantex pump out performed the compressed nitrogen. The compressed nitrogen pressure tailed off over the pack life producing a weak spray and drips and dribbles at the end of dispense. The Quantex pump produced a consistently high pressure over the life of the pack and the reverse cycle at the end of dispense created a sharp shut-off without any dripping. This also has the benefit of keeping the nozzle clean. Watch the spray video again to see the sharp shut off at the end of spraying.